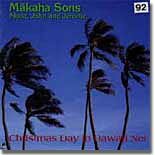 Hawaiian Music / Makaha Sons - Christmas Day in Hawaii Nei . Makaha Sons are: Louis R. Kauakahi-vocals and 6 string guitar - Jerome K. Koko- vocals and 12 string guitar - John K. Koko - vocals and acoustic bass. Special guest artists on this album include: Robi Kahakalau, Rocky Brown, and Darlene Ahuna. Robi Kahakalau sings in 4 languages on Silent Night (beautiful). Guest performers include: Genoa Keawe, Manu Boyd, Bobby Igano, Mike Lewis, and Bill Beimus.